Three summers ago, I was in love with my local water park. I would take my two nieces almost every day while my sister worked, and we would fly down the slides, splash around in the playground area, and just go for some old-fashioned swimming. I would buy salads, thinking they were healthier than the sandwiches and chips my sister packed for my nieces. When we were done, I’d drop them off home and go home to my own two children, my dogs, who I’d take out for walks and roll around with in the grass (only to go back home and shower, again). Between close contact with animals, public water parks with possible contamination, eating foods with unknown origins and irrigation quality, and other factors that I may not be aware of, there are so many qualifications that could have led to my struggle with blastocystis hominis. After a few trips to the doctor, he took stool samples and was able to determine I had blastocystis hominis. I’d been hearing horror stories from my sister: she didn’t believe the doctors would be able to detect anything, and so I was relieved. However, the lack of results for curing my disease quickly set me off into becoming irritable, frustrated, and even feeling hopeless at times. I was given metronidazole, however the medication had no effect and I felt worse. The Journal of Clinical Gastroenterology published a review in 2010 that admitted antimicrobial medications are not a straightforward treatment, and that recurring infections, increased drug resistance, and failure to eradicate the body are common. I’ve learned that even when B. hominis is properly diagnosed, the medical field does not have a clear understanding of how it works, and therefore there is no established, easy cure. When anti-parasitic medications are prescribed, there are many potential side effects, and knowing the proper dosage per individual is difficult–if not altogether impossible–to determine. I had no idea how to solve my issue. I tried changing my diet, removing any produce that couldn’t be peeled, consuming more garlic (my husband actually started sleeping in our guest bedroom because he cannot take the scent of garlic, and it was permeating from my skin), and trying whatever I could to rid myself of the parasite. My symptoms would disappear, but as soon as I tried to incorporate my normal foods into any meal, I’d have a flare up. I started getting afraid. I’d read that IBS and blastocystosis were linked, but the lack of evidence didn’t say what the correlations were. My body had become resistant to the prescribed medication, but I kept taking it in hopes that it would suddenly kick in. I was doing O.K. in school, but wasn’t able to put out the effort I wanted in my courses. What really frightened me was I’d dropped out of college before, just after high school, and had waited several years to go back. I didn’t want to wait any longer to graduate. With the lack of evidence, conclusive arguments about what b. hominis is even classified as, I was stunned. I would throw fits about how I didn’t travel anywhere, and my nieces weren’t affected (they actually were and, thank goodness, their mother didn’t hesitate taking them to the doctor even though she is traditionally against such services, and the children’s infections were cleared up with probiotics and prescription medication). I wasn’t able to socialize, behave in my usual way, or work at my desired pace and energy. My relationships were becoming strained, and I wasn’t happy to even be around myself because of embarrassment and discomfort from diarrhea and bloating. I started getting recurring yeast infections, more fatigue, allergy attacks, and even stiff muscles late at night. I spent too much money on doctor prescriptions, natural supplements that my sister told me to try, and parasite-cleansing products that just did not work. When trying to do research and understand my infection that would relate to me as a person, not the biological processes that treated my body like a plant or some distant being that didn’t have feelings, I came across a website that promoted two products: Canxida Restore and Canxida Remove. Even though my first thought was that this was for yeast infections only, since I’d had them recurring, I thought I’d check it out. My sister had always raved on using probiotics, but I wasn’t finding her suggestions effective. Two months into using the products and maintaining a healthy diet, I felt good. My energy was back up, my allergies under control, and my digestive tract purring as it should. I was leery on reincorporating any questionable foods back into my diet, even though I did miss my carbs, like pasta. I took the risk one Friday, and had no negative effects. I waited until Monday, tried again. My body was functioning just fine. 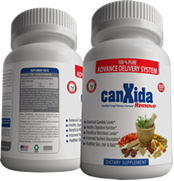 I’d been able to heal myself, but kept on the Canxida products for eight months, just as a severe precaution. If I even detect a yeast infection, or bloating, I get nervous, but know how to cure myself before my mood, relationships, and life suffer. I’ve created this site to help inform others about the parasitic disease, treatment options, and other pieces of information so that those who suffer can better know why diagnosis and treatment are difficult, potential risks associated with leaving the infection untreated, and how they too can overcome this and restore their body to its proper function.